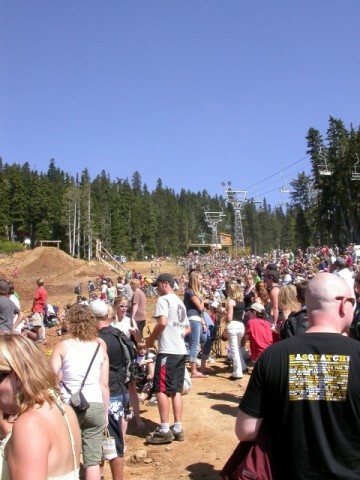 Mount Washington Alpine Resort will not be operating a mountain bike park for the Summer of 2013. Due to escalating costs which includes things like insurance, fuel and labour as well as a continued flat market the Resort has made the decision that the Bike Park is not a viable operation at this time. Don Sharpe, Director of Business Operations and Marketing states “it is unfortunate that we have to close the Park but over the last few years we have struggled to create a Bike Park that can grow the business however, the numbers are not there to support the operation”. Mile High Scenic Chair Rides along with events such as Tapped (Beer Fest) and the Wine and Food Festival will carry on as they have in the past. The Resort opens for summer business on June 28 with the Mile High Scenic Chair Ride, bungee trampoline, hiking, Fat Teddy’s Grill, and other family activities. 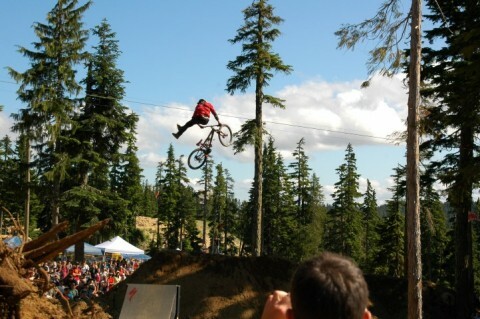 With this news, lift access mountain biking comes to an end on Vancouver Island, but did it have to happen like this? 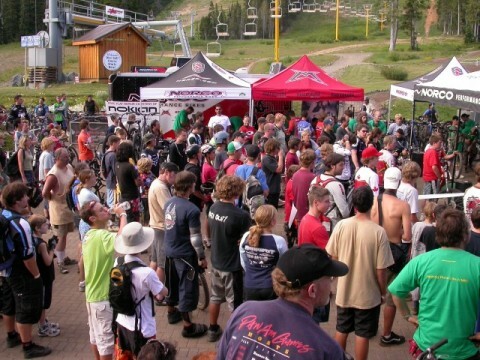 Will the Bearclaw Invitational still occur? What about a planned BC Cup event? Lets look back over the last 10+ years of biking at Mount Washington. First stage from the first trails and fire road rides to dedicated trails such as Blue Vein, Scratch and Sniff, Monster Mile and more. In the early years, bikes, riding styles and more were evolving. We broke lots of parts, bikes were re-engineered and things became more advanced. Whistler developed trail standards, go-pro’s shared our experiences and riding continued to progress. Women, kids, adults of all ages came together and joined in this sport. Call it growing pains, or just mistaken efforts, but people started to notice flaws in the system. The dedicated trail crew were not keeping up with maintenance, new trails were being developed while favorites were closed down. Locals and riders across the island offered to come join in for early season trail work to get trails up to speed. Management declined. In the mean time, prices continued to rise. People started looking at it and it was more enjoyable and only slightly more expensive to travel to Whistler, Silver Star and Sun Peaks. Trails were rough, tough on bike parts, not beginner friendly and worst, inconsistent. A great example for us was our summer road trip last year where we tried Kicking Horse and Fernie Alpine Resorts. We had never ridden Kicking Horse, but not once did we second guess what lay ahead. It was still a mostly rough and tumble resort, not much smoother than Mount Washington, but consistent. Every time there was a wooden gap, the end and start boards at each side of the gap were painted very bright colours. Signs were placed low and visible to a rider, ride arounds were always at the ready if something was too extreme. We had a great day. We came back to Mount Washington a few weeks later, found drops without ride-arounds or safe lines, signs for drops were out of the full face helmet wearing riders view, take off’s landings and jump shapes were inconsistent, and the merge at the bottom of the hawk was as brutal as ever… 5 years later. Consensus from our group? It needed serious help or wasn’t worth it. We brought an Australian who’s been riding both down under and in Whistler, and he left very disappointed. Not good. Did complacency develop within management and the trail crew. The passion which I remember from the early days hasn’t been there of late. A lot of people I know used to buy seasons passes. Now your bike just takes a beat down each lap and isn’t worth it. One can ride shuttles on Forbidden with your friends all day for less money in gas. Looking at what’s been a success in other resorts would make sense. It’s not a matter of all new stuff, but taking time to review and renew. It’s suggested the market is flat, while bike shops on Vancouver Island are having record spring sales. the return of PST has dropped the price of big ticket bikes and people are investing. The biggest concern comes that the shuttle traffic will end up on un-maintained trails in the valley. That stress on the trails will not be sustainable. What Mount Washington has done is reckless and has put undue risk to trail users and riders across Vancouver Island. 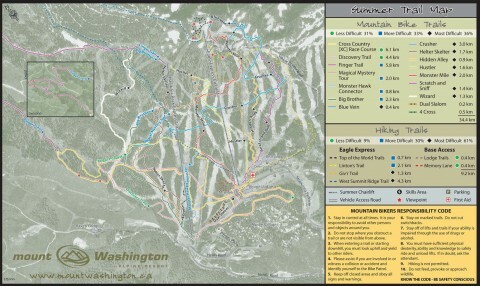 Considering the 2013 Summer brochure already in circulation offers up biking, hiking and more, Mount Washington could reconsider this change. Maybe just weekend operation? Offer discounted trail passes for people who come help out before opening day? The mountain bike community of Vancouver Island is capable of many things. Revival of a bike park is one of them. Develop trails that fit with the bikes being sold. Enduro All Mountain bikes are whats being sold. Trail networks which utilize this to their advantage would be eternally successful. To sum up, here’s a comment on Facebook from a local craftsman who’s dedication to the sport of mountain biking is seen in the bikes he builds and the events he attends. Well written, and you echo the thoughts of myself and of many local riders I know. This is a sad day the management must see past the apparent short fall of money and accept help from the bike club who have a passion on doing it great and making it work. Does management not realize what will happen now with the winter operations? Full-time staff that are educated and trained in running the mountain will leave and go somewhere else. Mt. Washington cannot expect employees to dedicate their careers to the mountain when Mt. Washington does not have any loyalty to their valuable employees. This is not well thought out in any way. Expect a poorly run mountain next season.